1930 began the "junk formula" (1930-37) at the Speedway where the rules were opened up and cars of all sorts showed up - even passenger car manufacturers like Studebaker and Ford got involved during this period. The 1930's was the era of Art Deco and the 1930 program follows in that vein with several cars streaking across from top left to bottom right on a black background with pink and white accents. The 1930 is the last of the programs with oversize covers and measures 11 1/4" x 8 3/4". There are no page numbers for 1930 through 1932 programs. No insert for 1930 or for the years 1931 through 1935* as the information is printed in the program. 1931 keeps with the Art Deco theme, this time black and gray cars with red lettering and lightning bolts. The size reduces back to 8 1/2 x 11 and remains so through the rest of the pre-World War Two era. The 1932 program tones down the Art Deco a bit with a single car heading down the straight in front of red and black stands over a pinkish background. Red, white and black lettering are used. 1933 reverts back to the Art Deco with a predominantly green cover with white and black lettering. A green and black car heads toward you from out of the distance. The worst years of the Great Depression were in 1932 and 1933 and the program reflects that in 1933 as it is the thinnest of the 1930's programs coming in at just 64 pages. Pages numbers also re-appear for the first time since 1916 and will remain through 1937. The 1934 program depicts the state of Indiana at center, the Soldiers and Sailors Monument on the Circle in downtown Indianapolis in the center of the state, the Speedway to the top left of the Circle, an airplane at top left, a group of spectators at left awaiting entrance to the track and a speeding race car at lower right all in a green and white with black lettering. 1935 has a bit of the Art Deco still going as two gray and black cars sweep on a curve from mid-right to bottom center on a white background with gray, red and black highlights. 1936 is a little toned down from 1935 with a yellow-orange background with a driver, spectators, the pagoda and some lettering in a medium blue. black highlights and lettering add to the overall cover design. 1936 sees the return of the insert which is called a "Lap Prize Fund" and it is dated. For the 25th Anniversary in 1937, the Speedway produced a silver, blue and white cover with "Silver Anniversary" in large blue script over a silver background at top. At center from left to right are "A" Stand, a typical period race car and the Pagoda. Below and to the left is a band major in blue & white with flags behind him. 1938 is one of the more interesting covers of the 1930's with a red, white and blue theme and Art Deco style. Flags of various countries are at top left, grandstands, and the starters stand with a car streaking underneath are at top center with Art Deco writing at below center. While maybe not as interesting as the 1938, the 1939 is still a sharp program with a predominantly blue and white cover highlighted by yellow writing with the pace car at center right streaking through the first turn on the pace lap with the field in line ready to go. There are no page numbers for 1938 through 1941 programs. The 1940 is blander in design and not quite as Art Deco as previous programs showing a gray and white background to the cover with red and black writing. A single streaking car is seen at center inside a red square, it's shadow following close behind. For 1941, the Speedway went to an old theme as it is reminiscent of the 1920 program showing a car and clock but with the addition of an airplane. 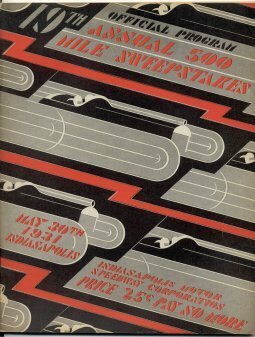 Red lettering on a white and blue background make up a nice program for the last pre-World War II Indianapolis 500. The 1941 insert is the first insert to show the starting positions of the field and this format, or one very similar to it, was used up through 1976 with the same basic concept still in use today. Inserts from this period through 1976 are generally a little smaller than the program. The toughest of the 1930 through 1941 programs to get would be the 1931 followed by 1937 - only because the silver on the 1937's tends to get worn off easily making it tough to find in excellent condition. Next would be 1932, '34, '35 and '40 followed by 1933, '38, '39 and '41. Lastly 1930 and '36. Some programs have an issue with pages coming loose from the staples and as the 1930-1932 programs have no page numbers, it can be hard to tell if pages are missing. One way to tell on programs from this era is with the 1911-1941 reprint programs. Although not affecting page numbers, the 1936 and 1937 original program have ticket order forms on the inside of the front cover while the reprints do not.